Old World vultures is the common designation for various large birds within the family Accipitridae, characterized by a head with few or no feathers, the lack of a perforate nasal septum, keen sight, good soaring ability, a poor sense of smell, and generally by scavenging behavior, feeding primarily on carrion. Old World vultures only comprise part of the family: Accipitridae also includes eagles, buzzards, kites, and hawks. Old World vultures belong to a different family than the superficially similar New World vultures (family Cathartidae), which share a similar featherless head, large size, good sight, scavenging behavior, and good soaring ability. However, these two groups are not considered to be closely related genetically and often are even placed in different orders, with New World vultures placed in Ciconiiformes with storks and Old World vultures in Falconiformes. Old World vultures lack the good sense of smell of some of the New World vultures and are limited to finding carcasses by sight. Old World vultures, with their large size, and unique form and behavior, add to the wonder of nature for humans, while also providing a valued ecological role as scavengers. In certain areas in India, they have even been given access to human corpses within secluded, walled facilities, a custom that reflects a cultural recognition of the continuity of life and death (Freedman and Frost 2008). 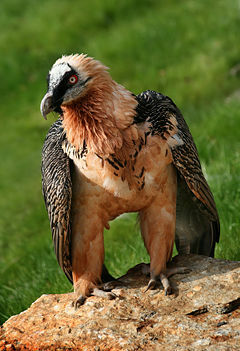 However, human pollution also has led to threats to vulture populations, such as strychnine used in Europe leading to the decline of the bearded vulture (Gypaetus barbatus) (Freedman and Frost 2008), or diclofenac poisoning of vultures when this drug is used to treat farm animals that later are eaten by the vultures. Accipitridae, the family of birds to which the Old World vultures belong, is one of the two major families within the order Falconiformes, the diurnal birds of prey. In addition to Old World vultures, many well-known birds like hawks, eagles, kites, and harriers are included in this group. Most, but not all, other raptors belong to the Falconidae, or falcon family. The Falconidae often is considered a distinct order (e.g. in the Sibley-Ahlquist taxonomy), in which case Accipitridae is considered to be belong to the order Accipitriformes. The accipitrids are a family of small to large birds with strongly hooked bills and in some species there is a notch or "tooth" in the upper mandible. In all accipitrids, the base of the upper mandible is covered by a fleshy membrane called the cere which is usually yellow in color. Accipitrids have a variable morphology based on diet, and feed on a range of prey items from insects to medium-sized mammals, with a number feeding on carrion and a few feeding on fruit. There are about 65 genera and 231 extant species recognized in Accipitridae (Lerner and Mindell 2005). Old World vultures are a diverse group within Accipitridae, with 14 to 16 extant species divided into nine or ten genera. The Old World vultures are variously grouped together in their own subfamily Aegypiinae, or divided into two subfamilies, Aegypiinae and Gypaetinae (Lerner and Mindell 2005; Lerner 2007), or placed in the same subfamily, Accipitrinae, as almost all members of the Accipitridae family (ITIS 2008). Old World vultures are found in Africa, Europe, and Asia, including the Middle East, the Himalayas, and Malay peninsula. They are large birds. The black vulture or Eurasian black vulture (Aegypius monachus) is the largest bird of prey (Falconiformes) in the world, though nearly equaled by the Lappet-faced vulture and the Himalayan griffon vulture. (The Andean Condor (a New World vulture, in the Cathartidae) is however slightly larger.) The black vulture is 98 to 110 centimeters (39-44 inches) long with a 250 to 300 centimeter (99-119 inches) wingspan and a weight of seven to 14 kilograms (15.5 to 31 pounds), and is thus one of the world's heaviest flying birds (Snow and Perrins 1998; del Hoyo et al. 1994). The lappet-faced vulture (Torgos tracheliotus) is the largest of the African vultures and second in size to the Eurasian black vultures among the New World vultures (Freedman and Frost 2008). Old World vultures largely are scavenging birds, feeding mostly from carcasses of dead animals. One species, however, is potentially frugivorous, the palmnut vulture (Gypohierax angolensis), which eats the nut of the oil palm, although it also eats dead fish, crabs, and mollusks (Freedman and Frost 2008). One species uses tools, the Egyptian vulture (Neophron percnopterus), which employs small rocks to crack thick-shelled ostrich eggs by lifting a stone with its beak and hitting the egg in a strong swing of head and neck. The bearded vulture or lammergeier (Gypaetus barbatus), found in Africa and Eurasia, will drop large bones onto rocks to open them up to make available the internal, nutritious bone marrow (Freedman and Frost 2008). Old World vultures find carcasses exclusively by sight, unlike some of the species of New World vultures that have a keen sense of smell. Because of this, their habitat is restricted to open country (Freedman and Frost 2008), whereas species of New World vultures can be found in almost any habitat where they can find carcasses, including forests where they have to employ their highly developed sense of smell to find decaying mammals, rodents, and birds. Old World vultures are characterized by a featherless or nearly featherless head, which is thought to be an adaptation to eating carrion, with the lack of feathers preventing blood and food from sticking and bacteria from the carrion ruining its feathers, while also exposing the skin to the sterilizing effects of the sun. Old World vultures lack a perforate nasal septum, a feature that is characteristic of the New World vultures. That is, the nasal passage of the Old World vultures is divided by a septum, whereas in New World vultures the lack of a septum allows one to see through the beak from one side to the other (Allaby 1992). They also tend to be solitary in behavior, unlike the highly gregarious New World vultures. The Old World vultures generally are divided into one or two subfamilies. While it is common to place them together into their own subfamily, Aegypiinae, some have noted that three species tend to be highly divergent from the remaining species and place them in a separate subfamily called Gypaetinae (Mundy et al. 1992; Lerner and Mindell 2005). These three species (and three genera) are the palm-nut vulture (Gypohierax angolensis), Egyptian vulture (Neophron percnopterus), and Lammergeier (Gypaetus barbatus). The nuclear and mitochondrial DNA studies of Lerner and Mindell (2005) likewise supported the view of others that the Old World vultures do not form one monophyletic group within Accipitridae, but are probably a polyphyletic group that should be separated into two separate clades, Aegypiinae and Gypaetinae. However, based on their genetic studies, they concluded that the Madagascar serpent-eagle (Eutriorchis astur) also should be a member of the Gypaetinae. Not including Eutriorchis astur, Lerner and Mindell (2005) recognize 14 species of Old World vultures placed into ten genera. The seven genera that they place in the subfamily Aegypiinae are Gyps, Pseudogyps, Necrosyrtes, Aegypius, Torgos, Trigonoceps, and Sarcogyps, with the three Gypaetinae members as Neophron, Gypaetus, and Gypohierax. The Integrated Taxonomic Information System places the Old World vultures together with most members of the Accipitridae family in the subfamily Accipitrinae, with the exception of the ospreys (ITIS 2008), although many taxonomic schemes place the ospreys in another family entirely. The following is one classification for the extant species of Old World vultures. 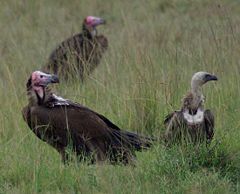 Some species of vulture are very susceptible to diclofenac poisoning, which causes the birds to suffer from renal failure and death, and this had caused a very marked decrease in wild vulture populations in the Asian subcontinent, where diclofenac used for farm animals has directly led to poisoning of vultures. Often farm animal carcasses containing diclofenac in their flesh are left out in to open for vultures to eat and tidy up. Meloxicam has been found to be harmless to vultures and should prove an acceptable alternative to diclofenac. del Hoyo, J., A. Elliott, and J. Sargatal (eds.). 1994. Handbook of the Birds of the World Vol. 2. Barcelona: Lynx Edicions. ISBN 8487334156. Freedman, B., and R. Frost. 2008. Old World vultures Vultures. Retrieved May 29, 2008. Integrated Taxonomic Information System (ITIS). 2008. Accipitridae ITIS Taxonomic Serial No. : 175280. Retrieved May 29, 2008. Lerner, H. R. L. 2007. Molecular Phylogenetics of Diurnal Birds of Prey in the Avian Accipitridae Family University of Michigan (Ph.D. dissertation). Retrieved May 29, 2008. Lerner, H. R. L, and D. P. Mindell. 2005. Phylogeny of eagles, Old World vultures, and other Accipitridae based on nuclear and mitochondrial DNA Mol. Phylogenet. Evol. 37(2): 327–46. PMID 15925523. (See full pdf text here) Retrieved May 29, 2008. Mundy, P., D. Butchart, J. Ledger, and S. Piper. 1992. The Vultures of Africa. London: Academic Press. ISBN 0125105851. Snow, D. W., and C. M. Perrins. 1998. The Birds of the Western Palearctic. Concise Edition. OUP ISBN 019854099X. 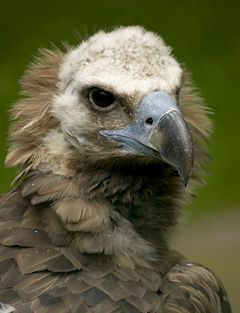 History of "Old World vulture"
This page was last modified on 1 June 2008, at 18:34.